NextThe Churning of the Ocean of Milk. The Napoleonic Expedition to Egypt. The French were among the earliest modern explorers to “rediscover” the great monuments of the Ancient Egyptians. The King of France, Louis XIV, in 1672 commissioned an expedition to the land of the Pharaohs with the purpose of procuring antiquities. With very little success, Louis XIV had laid the groundwork for future expeditions to try and succeed where he had failed. A little over a hundred years later, a very ambitious Frenchman by the name of Napoleon Bonarparte, landed in Egypt in 1798, with all purposes of undermining Britain’s access to its trade routes in India. Napolean had a grand vision of Empire and was told that a conquest of Egypt would more than compensate for the loss of the French West Indian colonies to the British. After Napoleon landed in Egypt and seized control of Alexandra, he turned his attention to scientific study. Along for the ride, Napoleon had brought with him approximately 150 architects, artists, students, scientists and engineers, whose job was to faithfully record everything that they witnessed. The magnificence of ancient Egypt truly overwhelmed everyone involved in this unique scientific and academic expedition. Napoleon was credited for being sensible enough to realise that scientific conquest was as important as military victory. “We must hold scientists in great esteem and support science” he was recorded as saying. Everything from topographical surveys to native plants and animals were studied, local trades were inspected and above all else, ancient Egypt was rediscovered. The temples and tombs of Luxor, Philae, Dendera and the Valley of the Kings was measured, mapped and drawn by artists. ‘The Egyptian Expedition under the orders of Bonaparte’, painting by Léon Cogniet, early 19th century. 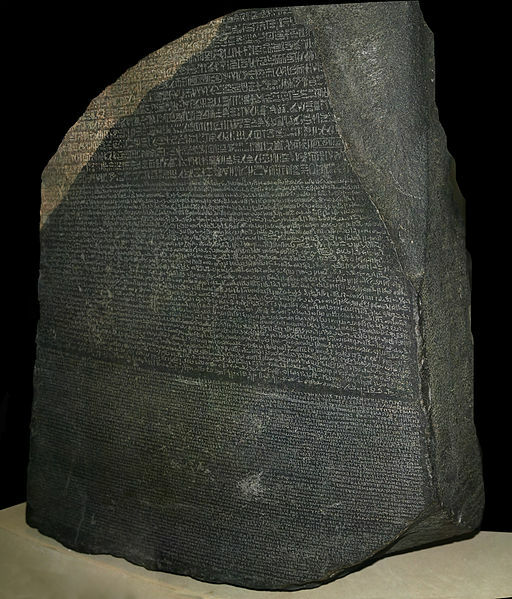 One of the most famous discoveries made by the French was that of The Rosetta Stone in July 1799. An engineer and officer in Napoleon’s army was about to demolish an ancient wall in the city of Rosetta, when he noticed The Rosetta Stone built into the wall. He recognised that the stone had three scripts written on it: Greek, Egyptian demotic and Egyptian hieroglyphic. He saved the stone and it was taken to the scientific team in Cario. The stone would become the key to deciphering the ancient Egyptian hieroglyphs. The world would learn in 1809, what Napoleon’s scholars had discovered in the published works entitled Description de I’Egypte. In all, by 1828 there would be a total of 23 volumes capturing Egyptian life and culture. With a treasure trove of records and great finds including the Rosetta stone, the Napoleonic expedition would leave us a powerful artistic account of ancient Egypt. In the years after Napoleon, others would be inspired to explore Egypt too. It is here that Egyptology was born. Though, it is somewhat of a shame that after Napoleon, Egypt over the next 100 years would become for some opportunists, nothing more than a ‘smash and grab’ exercise, before common sense eventually prevailed. The header image of this article shows Napeoleon Bonaparte before the great Sphinx (ca 1868) by Jean-Leon Gerome, Hearst Castle.